Many thanks to Keith Wallen for sending in some images from the early 1960’s taken from a local advertising guide. 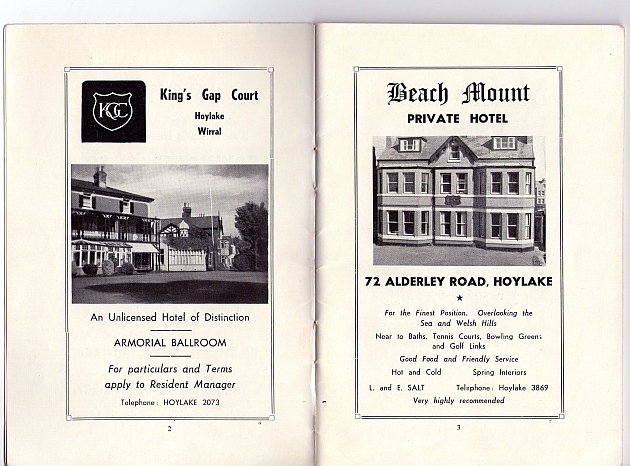 Featured above are two adverts for the Kings Gap and a hotel that I’d never heard of called Beach Mount. Why was the Kings Gap Amorial Ballroom so called? I think amorial has got something to do with heraldry or heraldic arms? Below is an old image of the old Stanley Hotel. The building is no longer as it was demolished to make way for retirement apartments called Montrose Court. For several years the building was a well known pub/bar …Flat Foot Sams, which subsequently became the Orange Grove. In it’s hey-day, Flat Foots was hugely popular – with patrons anyway! Also mentioned in the old guide was an ambulance station at a place called Broomfields. Was Broomfields on the corner of Kings Gap, next to the roundabout (now an apartment block)? I hope somebody has got an old photo! Yes Broomfields stood on the other side ,opposie The Stanley,or Flat Foots or whatever. In the 60’s my aunt had her wedding reception at The Stanley Hotel,in the 80’s I had my wedding reception at Broomfields! In the late 50’s early 60’s though it was a baby/health clinic and yes later ambulance station. Well the ambulance area was kinda tagged on the side…..
Beechmount and Sandtoft were next door to each other in Alderley Road. My family owned and ran Sandtoft Hotel from around 1950 until 1978. Sandtoft was no 70 and Beechmount was 72 Alderley. When my parents sold the business it did continue for w ahile as a guest house/hotel. Eventually when Mr and Mrs Salt who rean Beechmount retired- it became possible for the 2 identical houses to be joined together and ultimately Sandtoft Resdiential Nursing Home cam into being. There was another small hotel at No 66 Alderely Rd-back in the 50’s- Corcreigahn- run by a Mrs Thompson. Another small private hotel of the period was in Stanley Road but the name escapes me; it was demolished in approx 1975 and replaced with the unispiring Dunedin Court apartments which, due to the lack of any serious attempt at landscaping, still look very much an alien presence 3.5 decades later. Does anyone remember the name of the hotel or owner? The hotel and my mother who ran a B&B in Curzon Road used to regularly send each other surplus guests as she did with Mr Thomas at Strathveda in The King’s Gap and the Vines at Sandtoft. Incidentally both the Stanley and the existing King’s Gap Court had function rooms. The new King’s Gap Court will have no function rooms to my knowledge so this is a disappointing and unremarked upon loss to Hoylake’s ability to host weddings, small conferences, dances, etc. Peter- the hotel in Stanley rd was called The Dunedin. Trying to recall the owners name- think maybe it was Storey or Storry- but not 100% on that. As you say there was quite a bit of cooperation between them, your family and mine at Sandtoft. Was it Mike Storey? Dredging my memory cells here…! It was either Storry or Storrie – but not Storey. I have an old Hoylake guidebook somewhere which contains an advert and his name, but the house is upside down due to decorating just now, so can’t lay my hands on it ! When Mr. Storry obtained his greengroceries at Waterworths in Market Street, he used to weigh out his own potatoes to save time, which evidently caused no problems with the staff. 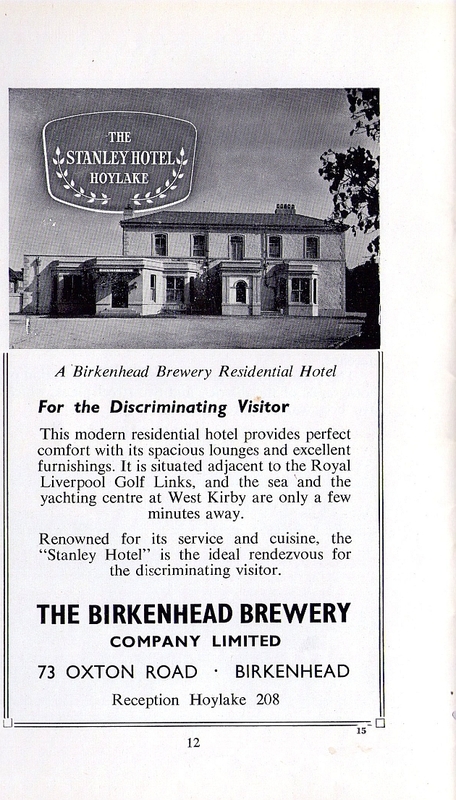 I have just checked my Hoylake Official Guide (circa 1961) and the proprietors of the Dunedin Private Hotel at 14 Stanley Rd. (Tel Hoylake 2555) were Mr & Mrs N.Storry. “Corcreighan” Mrs T. Thompson at 66 Alderley Rd. I’ll try and scan and send through to John. my name is Sandra, and my Grandmother used to own “Corcreighan”. Unfortunately I haven’t any photo’s, as my father died when I was 6yrs old and my mother Joyce, Mrs Thompson’s daughter migrated to Australia when I was 8yrs old. I am trying to peice together my past, but it’s quite hard from Australia. So I was wondering if you could scan a photo and send it to me. I would appreciate ti very much. I think you my have found the other photo by now, but if you still need another copy please contact me here :- kwallen47@hotmail.com. I attended the maternity clinic at Broomfields in 1975. After it closed it became a nursery for a short while, my daughter went there. I think it also became a restaurant again, only for a short while. My father served in the Fire Service based at Wallasey during the second World War and he used to recount a story that whilst on a training session the fire engine was driven through the small gates at the Stanley Hotel apparently without mishap. Quite an achievement. Doubtless the training fireman needed some refreshment. My sons enjoyed Flatfoot Sams very much, it was The Place to Go in Hoylake! Followed up by a ‘club’ somewhere on the Carr Lane Industrial Estate called The Mirage! Sad to say we lost Mike Storry at the end of January this year. Mike was born about the end of WWII and was a great help in organising the many Parade School reunions. I believe he frequented the Ship Inn to catch up on local gossip during his visits to Hoylake from his home town in Shropshire. Photos of Mike are on the Parade School site on facebook. I should just add that we used to stay in the Sandtoft in the late 80s whilst visiting ageing parents. It was of course right next to the Winter Gardens Cinema. I am sure it was run by someone called Beech. By the millenium, it had become and old folks home, and I think Charlie Tranter of HASC fame (and Olympic Diving Judge at Tokyo and Melbourne) spent his latter days there. Marion Beech ran the Sandtoft Nursing Home it was owned by her then husband John Gallagher, It has now passed into new owners. I was a friend of Mike Storry and I know he would be delighted to know that his parents hotel was the subject of comments on the Hoylake Junction site. The other “old” hotel in Stanley Road is the Green Lodge not only a golfing hotel but also an old coaching inn. are you refering to the “old” Punchbowl Inn which was pulled down in the 1930`s? . There are plenty of photos of it but I never heard much about it`s history, however it was supposed to be the oldest public house in the village and I did read that the building pulled down in the 30`s replaced an even earlier building also named the Punchbowl. Syd, yes , my great great grandfather , Thomas Hughes, was an owner of a Punchbowl Pub on Market Street in the late 1800’s. The Pub then went to his daughter, Mary Lizzie. Was just wondering if there was any listings as them being owners. Since, your name is Bird, are you a descendant of the Birds who lost there lives in the Lifeboat Tragedy of 1810. My direct ancestor was Joseph Hughes who lost his life along with his brother, Richard. I was wondering if any details of your families ownership of the Punchbowl might show up in either the 1891 or 1901 census,it might be worth checking there if you haven’t already done so. I will see if I can find anything of interest. If I come across any info regarding the Punchbowl I will certainly pass it on to you. I expect you will already have plenty of photos of the building demolished in the 30`s but if not I can send you a handful that I have, if you are interested. I live in Scotland by the way having left Hoylake in 1969. Love the website which I have just discovered – and bookmarked! My mum has been resident in Hoylake all of her life – born and bred as was her father. My mum was Jean Stephenson (now Bates) who resides in Alderley Road. She knew Mike Storry well and had started meeting up with him and some other ex-Parade school chums when he passed away very suddenly. I have not lived in Hoylake since 1989 and I have made it my mission to move back to Hoylake – from Northampton (where I moved to in ’89) – this Summer. Fingers crossed!